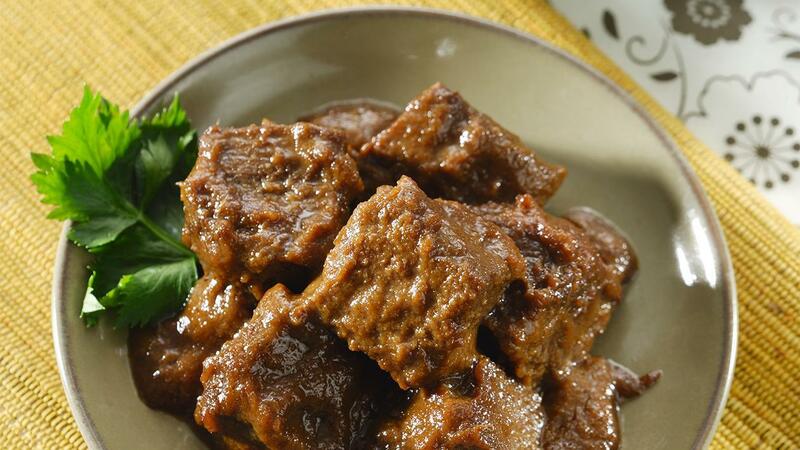 This Indonesian-style rendang-alike is a beef stew that will melt your diners tongue. Make them craving for more this sweet tasty dish. Boiling the beef shank until cooked and tender. Lift. Cut into pieces 3x3cm. Heat the oil. Saute the spices, bay leaves and lemon grass until fragrant. Add the sengkel beef. Stir well. Pour the coconut milk a little while in the mix. Enter Bango Sweet Soy Sauce and salt. Stir well. Cook until soft and pervasive. Add tamarind water. Stir well. Lift.